All the prep work on my summer garden has me fixated on vegetable dishes. 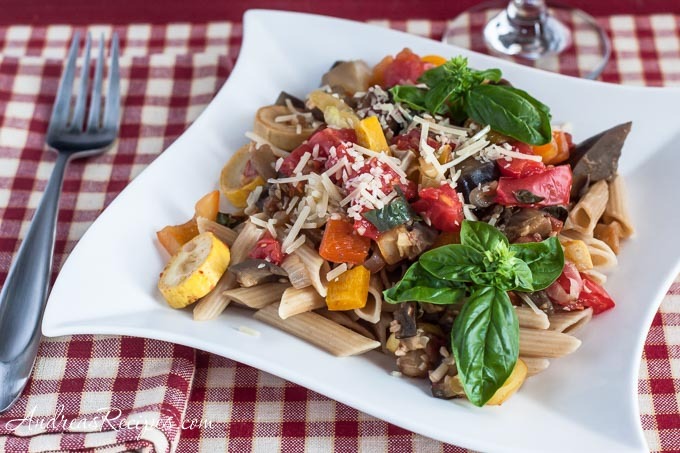 As I scooped more seeds from bell peppers and eggplant today, my mind drifted towards a pasta primavera for dinner. I love this dish in the summertime with fresh peppers and eggplant. You can adapt the dish based on whatever fresh vegetables you have on hand. In the 6 quart pot, prepare pasta according to package directions. In the 6 quart pot, saute the onion in olive oil until the onion glistens. Add the garlic and saute until garlic starts turning golden. Add the eggplant. Saute about 8 minutes, until it starts browning. Add the bell peppers and saute until the peppers are just hot. Stir in the zucchini, tomatoes, salt, pepper, oregano, and basil. Bring to a boil. Reduce heat to medium and simmer until the vegetables are fork tender. Don’t overcook or the vegetables will be mushy. Drain the pasta and put it back in the 8 quart pot. Add the sauce to the pasta and stir. Let it sit for about 5 minutes or so, until the pasta absorbs some of the juices.